Title: 02/18/1999 - Clarification of systems for electronic access to MSDSs. Thank you for your letter dated December 14, 1998, addressed to the Honorable Alexis Herman, Secretary of the U.S. Department of Labor, in which you requested clarification regarding systems of electronic access to Material Safety Data Sheets (MSDSs). Your letter has been forwarded to the Occupational Safety and Health Administration (OSHA) for a response. Below we have provided a brief history regarding the issue of electronic access. Following this, we have provided answers to your four questions. OSHA has allowed electronic access to MSDSs since at least July, 1989. Our most recent interpretation (written on October 13, 1998, to Mr. Mark Hoffman, Rudolph/Libbe, Inc., Walbridge, Ohio) expanded the use of telephone transmittal of hazard information in "emergency" situations. The term "emergency," as it relates to back-up systems for electronic access is discussed in our compliance directive, CPL 2-2.38D (Inspection Procedures for the Hazard Communication Standard, dated March 20, 1998). In this context, "emergency" is defined as foreseeable failures in the electronic system such as power outages, equipment failures, on-line access delays, etc., and is not meant to encompass catastrophic events, medical emergencies, or other situations. Previous to the October 13 letter to Mr. Hoffman, the only time telephone transmittal of hazard information was permitted was under the mobile worksite provision of the rule. The mobile worksite provision allows employees who travel between worksites during the work shift to phone-in for hazard information. In this situation, the employees have access to the MSDSs prior to leaving the worksite and upon returning. The telephone system, therefore, is seen as an emergency arrangement. If an employer maintains an electronic system as the primary means of providing MSDSs in the workplace, is it acceptable for employees to obtain hazard information verbally over the phone if the primary system is temporarily inoperable? Is it acceptable for employees to obtain hazard information over the phone in the case of other kinds of emergencies? In the event of a power outage, equipment failure, or other "emergency" involving a foreseeable failure of the primary electronic system, OSHA would consider telephone transmittal of hazard information to be an adequate back-up as long as the MSDS is delivered to the site as soon as possible. In emergencies other than failure of the primary electronic system, the MSDSs must be available and we would consider telephone transmittal of hazard information supplemental to the data sheets. Is it acceptable for an employer to rely on receiving verbal hazard information over the phone and then receive the actual MSDS as soon as possible, but no longer than two hours later? No. Ready accessibility to MSDSs means that the employee may read and refer to the information. OSHA interprets "readily accessible" to mean immediate access to MSDSs. The employer has flexibility to determine how this will be accomplished and may provide the data sheets via paper copies, computer terminal access, or some other means of providing readable copy on-site. The only situation in which it would be acceptable to supply a readable copy of the MSDS two hours after the request is made would be in situations where the primary system has failed and two hours describes the shortest time frame possible for delivering the MSDS. Is an auxiliary power system acceptable to ensure that an MSDS is retrievable in case of a general power failure? Yes. An auxiliary power system would be acceptable to ensure that MSDSs are retrievable in the situation of a general power failure. 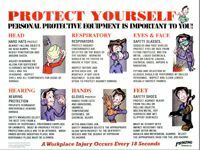 What is the employer's responsibility to provide an MSDS in the event of a catastrophe such as an earthquake or fire? The Hazard Communication Standard applies to any chemical which is known to be present in the workplace in such a manner that employees may be exposed under normal conditions of use or in a foreseeable emergency. A foreseeable emergency includes, but would not be limited to, equipment failure, rupture of containers, or failure of control equipment which could result in an uncontrolled release. This does not include fires or other catastrophic events. Laws such as the Emergency Planning and Community Right-to-Know Act provide an infrastructure at the state and local levels to plan for chemical emergencies and catastrophic events. The employer's obligation is to ensure that MSDSs are readily accessible during each work shift to employees when they are in their work areas. 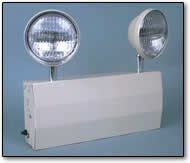 Emergency lighting from Safety Emporium keeps you safe in an power failure. Photoluminescent signs, wayfinding tapes and stair treads are also available at Safety Emporium. If we may provide further information or assistance, please do not hesitate to contact OSHA's Office of Health Compliance Assistance on 202-693-2190.